A group of runners associated with the Boston College Campus School trained to run the Boston Marathon route, but they won’t be running on Marathon day as they have done in the past. At most marathons, unregistered runners — known as bandits — are considered freeloaders preying on the good will of race organizers and official entrants. The Marathon’s historic allure, combined with its rigorous qualifying times, has made it a magnet for bandits, observers say. While smaller marathons offer easy entry, they lack Boston’s prestige. Boston and bandits have “gone hand in hand,” said Jack Fultz, a former marathon winner and the training adviser for the Dana-Farber marathon team. Before the Boston Athletic Association created the charity program in the late 1980s, thousands of people ran as bandits, knowing they would never qualify, Fultz said. “There was no other way in,” he said. The number of bandits has since declined, and the BAA has generally let them be. But this year, new security measures will make it far more difficult for unregistered runners, and Fultz said they won’t be missed. For two decades, bands of Boston College students have run as bandits, raising money and awareness for a special-education school on campus. Clad in bright yellow T-shirts, some 250 BC students ran without numbers last year, rebels with a cause. But this year, the Campus School Volunteers will be making their way this week from Hopkinton to Copley Square on their own. Given the new landscape, the Campus School Volunteers decided to bow out of the April 21 race and run on their own Sunday. Tom Grilk, executive director of the BAA, said the race’s policy toward bandits has not changed, and said only a few hundred people flout the rules. While the BAA “takes no joy in turning people away,” the narrow course only allows a certain number of runners, Grilk said. Bandits also make it harder for the race to provide services for registered runners, he said. At the New York Marathon, about 50 volunteers known as “bandit-spotters,” scan the waves of runners for imposters, then urge them to exit the course. Near the finish, the spotters become more aggressive, intent on preventing bandits from the thrill of crossing the line. “They should not reap that moment,” said Chris Weiller, spokesman for the New York Road Runners, which puts on the race. In Boston, the crackdown also convinced a group called Griffin’s Friends to change its plans, ending nearly 20 years at the Marathon. 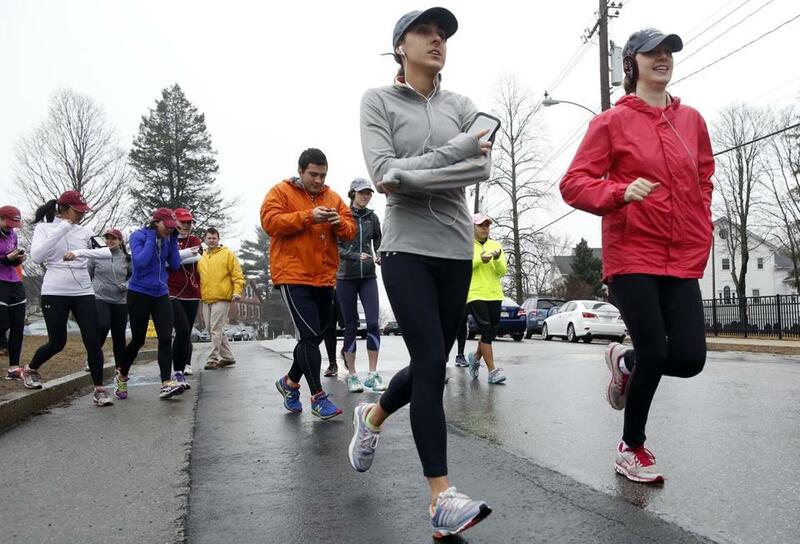 Instead, the group will run the Holyoke Marathon on May 4. “This year we are seriously concerned about planned security measures and the impact upon the safety and security of our runners, team captains, and families,” the group posted on its website. The Red Snakes — a small bandit group that has been running Boston for more than four decades — will also watch from the sidelines. Kate Finnegan, who directs the Kaji Aso Studio in the Fenway, said artists from the studio have not only run the race, they have passed out certificates at the finish line congratulating runners on their accomplishment. The group has generally run from the back of the pack and has never encountered problems on the course, Finnegan said. Most runners were less concerned about their time than savoring the camaraderie the race creates. “You feel connected to everyone that day,” she said. Yet other runners say they are undeterred by the new restrictions. Lucas Suh, 31, said he has run as a bandit at four other Marathons, and has no plans to stop now. With a best time of 4:20, Suh cannot qualify for the race, but said he loves the thrill of running it. At BC, students closely tracked marathon-related news as they trained through the fall, and began to realize that tighter security could well threaten their involvement. To their dismay, the BAA made it official in late February. Over the years, the group had tried to receive numbers through the Marathon’s charity program, but without success. Still, interest in the charity effort surged, and last year members raised a record $73,000 through the race. So while disappointed they couldn’t run Boston, members decided they could still run the distance on their own, to finish what they had started.